Average number of fake news articles shared on Facebook, by age. Photo credit: Data from Science Magazine (PDF) and Joe Cheng / Flickr (CC BY 2.0). A common trope from baby boomers is that young people today live entirely online. That social media has created an apathetic generation more interested in sharing memes than contributing to the real world. However, a new study found that it is, in fact, older Americans who use the internet in a manner far more divorced from reality. During the 2016 presidential election, Facebook users 65 and older shared an average of seven times more articles from fake news domains than younger users, according to a study published this month in Science Advances. The researchers found that, while fake news was shared by only a small portion of users in their sample, the age group results were consistent regardless of political ideology, party affiliation, or education level. “No other demographic characteristic seems to have a consistent effect on sharing fake news, making our age finding that much more notable,” the report concluded. The study — conducted by Princeton University professor Andrew Guess and New York University professors Jonathan Nagler and Joshua Tucker — adds to the ongoing debate about the influence of fake news in President Donald Trump’s victory over Hillary Clinton. Working with the online polling firm YouGov, the researchers were granted access to thousands of Facebook profiles following the election. Personal data was collected and links posted publicly during the campaign were cross-referenced against a list of publishers that created “intentionally false election-related stories.” The fake news sites were originally compiled by Buzzfeed News and included additional illicit domains identified by academic researchers. “Our most robust and consistent finding is that older Americans were more likely to share articles from fake news domains,” the report stated. However, the report determined that baby boomers cannot be blamed entirely for the misinformation campaigns during the run-up to the election. Researchers stressed that the sharing of fake news on Facebook was rare. Of the 3,500 participants in the study, 90 percent shared zero stories from the illegitimate domains. 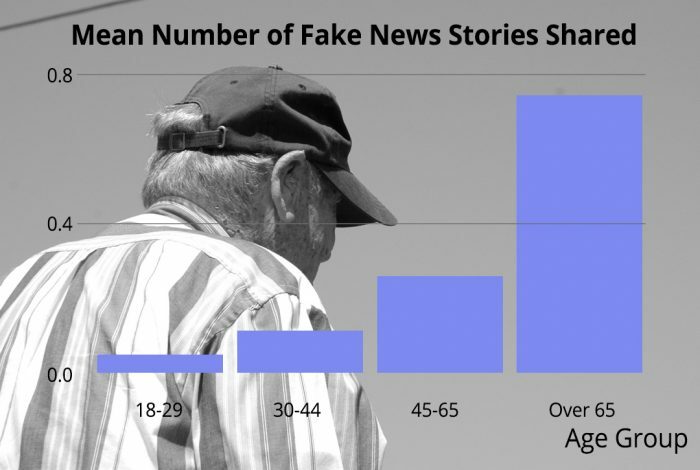 Nonetheless, when fake news was shared, it was most often shared by older Americans. “It doesn’t surprise us that older people could be especially susceptible, as they are not digital natives and may be less savvy in their online behavior,” Alan C. Miller, founder and CEO of the News Literacy Project, told WhoWhatWhy. The study’s results are supported by past research. The Pew Research Center found in 2018 that younger Americans are better at identifying factual statements in the news, whereas Americans over 50 are far more likely to incorrectly distinguish opinion from fact. “The kids are alright. Grandpa’s the problem,” the journalist and media blogger Jeff Jarvis wrote in response to the report. Perhaps unsurprising since the vast majority of fake news in 2016 was supportive of Trump — or at least anti-Clinton — the study found that Republicans and conservatives were more likely to share fake news. Participants that self-identified as “very conservative” shared the most articles from fraudulent domains. Another salient result was that users who posted more on Facebook were less likely to share fake news. “It is not the case that what explains fake news sharing is simply that some respondents ‘will share anything,’” the report stated, noting that users familiar with online posting were better able to determine real versus fake news. Older Americans “developed their media habits in a dramatically different information ecosystem — one in which markers of credibility were much easier to recognize,” Miller added. Not surprised that people who grew up in an era of photoshopping and reality TV and other kinds of fakery have a better ability to distinguish what's real and what's not. Despite the study’s overall finding that fake news on Facebook was shared by a small minority of users included in the sample, the social media giant has faced enormous criticism for its role in the 2016 election. Founder and CEO Mark Zuckerberg has already testified before the European Union Parliament and the US Senate to defend his platform’s editorial standards. Yet despite Facebook’s efforts to weed out fake news, fraudulent media content continues to circulate. In the 2018 midterm election, a doctored photo of Democratic Georgia gubernatorial candidate Stacey Abrams holding a pro–Muslim Brotherhood poster was shared on Facebook 25,000 times, according to Politico. As 2020 quickly approaches, many fear disinformation campaigns will again plague the presidential election; it is a concern that warrants attention especially as the number of American baby boomers on Facebook continues to grow. Related front page panorama photo credit: Adapted by WhoWhatWhy from hand: City of Seattle Community Tech / Flickr (CC BY-NC 2.0).